Compared to the outgoing model, this replacement is a huge step up in terms of both styling and packaging. The outgoing Nissan Rogue was never a bad small crossover, it was just rather dull. 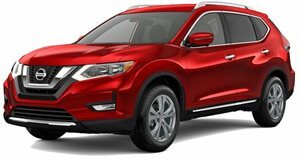 Nissan is out to change that with its replacement, which in other global markets will be called the X-Trail. With styling heavily borrowed from the larger Pathfinder, the X-Trail/Rogue is still very much a crossover, but it comes with Nissan’s advanced electronic four-wheel drive system. Front-wheel-drive remains standard. It’s not designed for major off-roading, but it’ll do the job more than well enough for most owners. What lies under the hood wasn’t announced, but we expect for the 2.5-liter I4 to carry over. Other features include a full length panoramic roof, a seven seat option and a flexible luggage area. Styling wise, the X-Trail has high wheel arches, "boomerang" rear lights, and LED daytime running lamps and headlights. Upgraded models receive 19” alloy wheels. A particularly nice touch is the fact that the middle row seats recline and slide forward, while the third row folds forward to increase luggage space. There’s also a large between-the-seats console box that’s large enough for an iPad. Owners will also have the NissanConnect in-car navigation, information and entertainment systems. For now, there's no word on when it’ll arrive in the US.